"The Chicago Disco summer tour has landed! And the second date of the tour is on gorgeous Waiheke Island - on the first Saturday after New Year, at Sandbar! We're going to be taking over the deck during the day, and rocking through inside that night till 1am." And a special guest while he's home from Sydney, Nergal U-Khan! We'll be firing up the barbecue on the deck, serving up American hotdogs, sausages and burgers (veggie burgers too), and the kitchen will be serving pizzas all day. Just a tenner on the door, doors open 2pm. Come have a beer in the sun with us. Sandbar = super cute Waiheke bar with a biiiig deck and a bigger view! 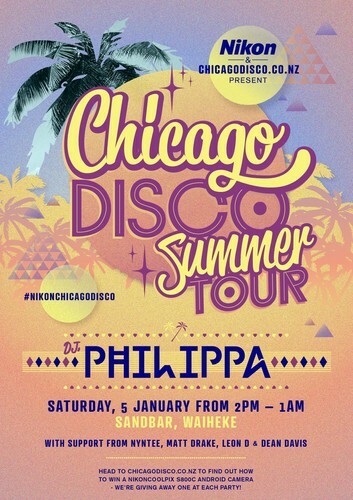 Go to www.chicagodisco.co.nz for full deets!